One problem that emerged from last year’s election was the stark realization that the progressive infrastructure—the congeries of think tanks, advocacy organizations, grassroots groups, training centers, and the rest that constitute the real working parts of liberalism—wasn’t quite the well-oiled machine some had thought. Going back a little more than a decade, Rob Stein undertook his study of the conservative infrastructure and showed progressives that they were being dramatically outspent on all manner of political activism. Stein founded the Democracy Alliance to bring wealthy liberals together to pool their money as a way of correcting the imbalance. The Center for American Progress was created, as well as Media Matters for America and other groups. The American Constitution Society, the progressive answer to the Federalist Society, got off the ground. The group Health Care for America Now (HCAN, as it’s known) played an important role in pressing for the passage of the Affordable Care Act. Alas, rich conservatives didn’t take all this lying down. The Koch Brothers and Sheldon Adelson and a handful of others have doubled down, especially at the state and local level. Liberal efforts are still routinely dwarfed by conservative ones, and the result, in addition to a White House lost to an incomprehensible person, is a liberal movement that is badly in need of some fresh approaches— and hundreds of millions of dollars to support them. With all this in mind, we asked 12 progressive advocates and thinkers: If someone were willing to give you essentially unlimited money to start a political organization, what would it be and why? And what would your group actually do week in and week out, and how would that change the status quo? Here are their answers. 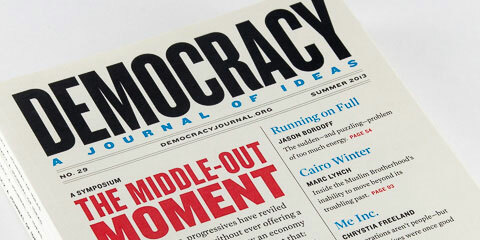 The Editors of Democracy: A Journal of Ideas are Michael Tomasky (Editor), Jack Meserve (Managing Editor), and Sophia Crabbe-Field (Associate Editor).